The recently refurbished Augustus Tower King rooms feature a classic Caesars theme, but with a contemporary update. Cool grey tones are accented by infusions of royal blue and champagne gold. A spa-style marble bathroom compliments the lavish style with dual sinks and a spa tub. The Laurel Collection's luxurious rooms are located on the Southern end of the property near the Garden of the Gods Pool and hotel lobby for convenience. Retreat to the elegance of the Palace Tower room. The open bedchamber is highlighted by a king bed, marble dressing table, and refreshment center, with dark wood furnishings. The elegance continues into the Caesars-style marble bathroom, complete with brass fixtures, dual sinks, and an oversized spa tub. The Palace Tower is located near the Garden of the Gods Pool and the Conference Center. 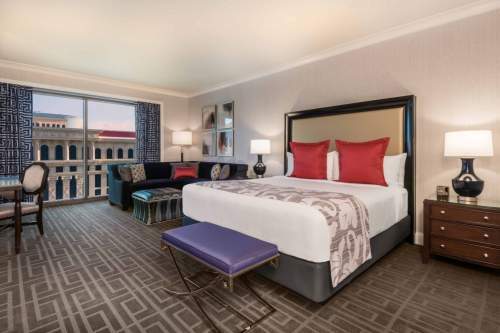 Stay in luxury with the Laurel Collection's lavish Premium Strip view rooms. The recently refurbished Augustus Tower features a classic Caesars theme, but with a contemporary update. Cool grey tones are accented by infusions of royal blue and champagne gold. These rooms include one king bed, an elegant marble bathroom with dual sinks and spa tub. The Laurel Collection's luxurious rooms are located on the Southern end of the property near the Garden of the Gods Pool and hotel lobby for convenience. One night here and you will realize that indulgence is not a privilege. It is a way of life. With 550 majestic square feet of enviable comforts, the Octavius Tower room features one king bed, exclusive amenities and state-of-the-art electronics. The Laurel Collection's luxurious rooms are located on the Southern end of the property near the Garden of the Gods Pool and hotel lobby for convenience. The recently refurbished Augustus Tower King rooms feature a classic Caesars theme, but with a contemporary update. Cool grey tones are accented by infusions of royal blue and champagne gold. The Laurel Collection's PetStay rooms welcome you and your dog(s) in tasteful opulence and thoughtful functionality. This king bedroom includes a marble bathroom with spa tub. These rooms allow two dogs up to 50 lbs each. Please call 1-800-CAESARS for more information about rules and fees.